The Iguazu Falls is a manifestation of nature's glory. It's no surprise that it is recognized as one of the New 7 Wonders of Nature. With close to 275 waterfalls bordering both Brazil and Argentina, it is the largest waterfall system in the world. The Iguazu Falls spans 1.7 miles (2.7 kilometers) wide and ranges in height from 197 to 269 feet (60 to 82 meters). About 80% of the Falls are on the Argentine side. There's a lot of debate around which side to visit, but we decided to go on a journey chasing waterfalls on both sides! A tourist visa is needed to enter Brazil. Private U.S. citizens who are visiting Argentina for 90 days or less for tourism or business will not need a visa. 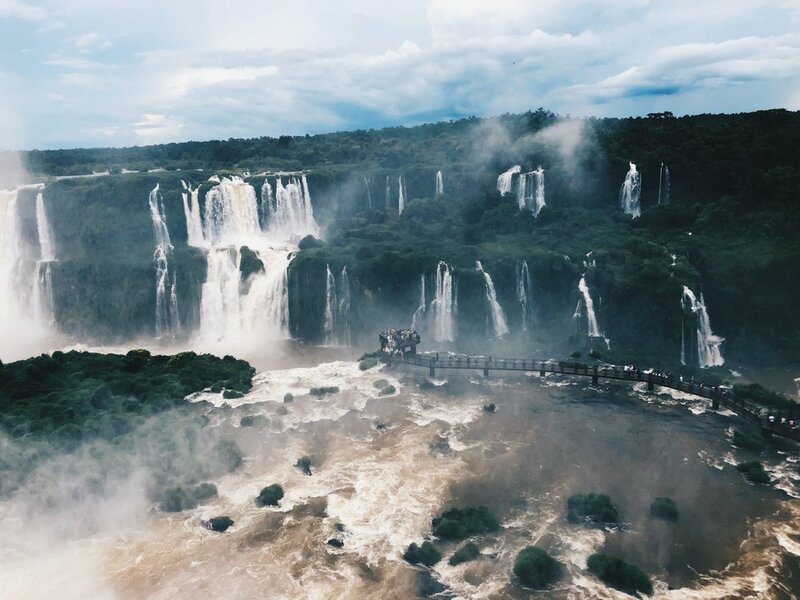 There are two international airports near the Iguazú Falls: Cataratas del Iguazu International Airport (IGR) on the Argentine side and Foz do Iguaçu International Airport (IGU) on the Brazilian side. We flew from Salvador and chose to fly into IGU on the Brazilian side, because it was significantly cheaper than to fly into IGR. Uber wasn't available in the towns of Puerto Iguazú, Argentina or Foz do Iguaçu, Brazil. There is a locally based car-ride sharing app called 99 that was sometimes reliable. But for the most part, we either had the hotel staff call a taxi for us or we caught one at a taxi stand. We arrived at the Argentine border control around 1am and there were no lines. We traveled back to Foz do Iguaçu during the day time and the migration office was crowded. Our taxi drivers had migration papers that we filled out en route. It took us about 30-45 minutes to get processed. Pro-tip: Make sure you agree on your price before you get in the taxi. A taxi from the the IGU Airport to Argentina should be around $39 USD and vice versa. On the Argentine side, the Iguazú Falls borders the Misiones province. We had a fabulous time at Hotel Guaminí Misión in Puerto Iguazú. We had three days in Misiones. During our first day we went to downtown Puerto Iguazú and stopped by different tour agencies and inquired about packages to take the boat ride under the Garganta del Diablo (Devil’s Throat). The Garganta del Diablo has the highest water flow of the Iguazú Falls. Due to a recent mudslide, it wasn't possible to do the boat-only excursion. They only sold the jungle trek and boat excursion combined, which took a different route to the falls that wasn't impacted by the mudslide. There was miscommunication about the need to purchase the tour in advance to avoid the boat ride selling out at the park. If you have your heart set on doing the boat ride during a particular time you should book it in advance. We were able to purchase the boat package at the park, but there was only one time slot available. Pro-tip: The tour agencies are all selling the same experiences for the same prices. If you are looking to purchase tours in advance, save some time and just visit one agency. We walked about eight minutes from our hotel to a bus stop in downtown Puerto Iguazú. We rode a Rio Uruguay bus to the Iguazú National Park. The buses run along many stops on the main road and can also be caught at the bus terminal downtown. The bus stop on the road was a little nondescript, but the locals are friendly, so dig out your Spanish and ask for help if needed. The buses run every 20 minutes (although they often run a bit behind schedule) and the ride is about 45 minutes. On the way to the park, we were able was able to pay the bus driver directly ($3.37). However, on the way back we had to purchase a bus ticket before boarding the bus. We bought the tickets in an office right beside the bus stop at the park exit. Pro-tip: As you can imagine, the bus route to the Iguazú Falls is popular. To ensure you get a seat, try to catch the bus on the main road. Most people get on at the bus terminal stop downtown. What to do Immediately As You Get to the Park? Grab a map at the information kiosk. There are maps posted throughout the park, but having your own makes navigation much easier. Book your boat ride ASAP. If you are planning on booking a boat ride ( I highly recommend you do! ), book it before you go further into the park. There's a kiosk near the information kiosk where you can purchase. It's an inefficient use of time to go back there in the middle of your visit because it can get really busy. The only time slot available for us was at 11am, which was perfect. Aim to book your ride between 10am and 12pm to avoid crowds. It was more expensive ($63) than I would have liked because we had to purchase the jungle trek with the boat ride . Avoid guided tours. Unless guided tours are your thing, having a tour guide is not necessary for getting a full experience of the park. Map out your plan. The three major highlights of the Argentinian side include the Lower Circuit, the Upper Circuit, and the Garganta del Diablo (Devil’s Throat). The Upper Circuit trail runs along the top of the falls, the Lower circuit runs along the bottom of the falls. I recommend the following order of visiting things – Upper Circuit, boat trip, Lower Circuit, and the Garganta del Diablo. The park was well marked with signage, which made it relatively simple to navigate. The park was entirely accessible by foot, but there is a train that leaves you close to the circuits. We visited the Iguazú Falls in January, which was during peak season (January-February). It was extremely crowded because it is during this time that most Brazilians and Argentinians go on vacation. 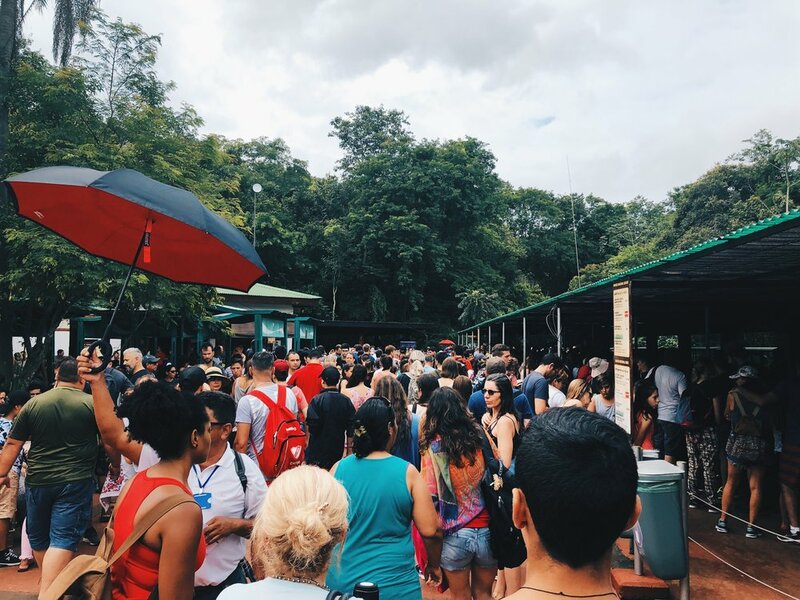 The ticket to board the train at Iguazú Falls are free, but it is suggested that you wait in line for them. Since it was so crowded and people were rushing, having a ticket wasn't enforced. Pro-tip: Although, the park opens at 8 a.m., the first train doesn't run until 8:30 a.m.. You can walk to the the Upper Circuit and beat the crowd that is waiting for the train. After walking through the Upper Circuit, we headed to the meeting point for our jungle trek and boat ride under the 80m tall Garganta del Diablo. The jungle trek was a truck ride through the Iguazú jungle that ended at the boat ride meeting point. 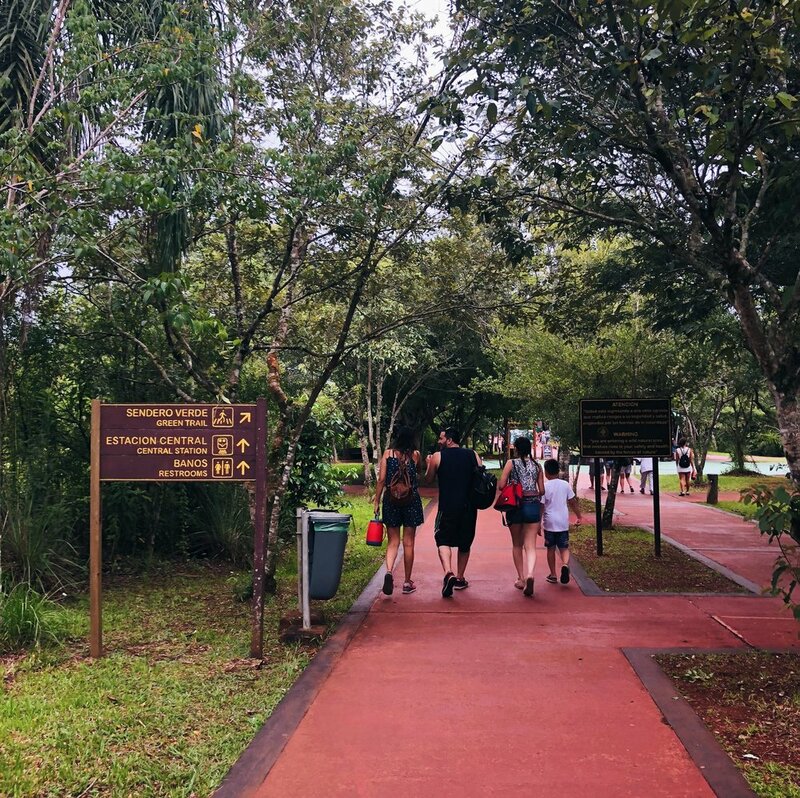 While it was nice to learn about the different plant and animal species at Iguazú, I felt that that the ride was an underwhelming experience that I could have done without. Before the boat ride, we were provided with life jackets and dry bags to store our belongings. It was an exhilarating but quick experience (about 20 minutes round trip). We stopped in the middle of the Iguazu River for a few minutes to capture the fantastic view of the falls. Once we were about to go under the Garganta del Diablo, the guide instructed us to put our belongings away. It was absolutely beautiful from afar. Once we went under it was all a blur -- I could barely keep my eyes open. But, I loved it! I felt like I was on a waterpark ride! After going under the Garganta del Diablo, we went to view it from up top. The sound of the water rapidly dropping from 269 feet into the Iguazu River was electrifying. The falls created a mist that left everyone soaked. How much time should you spend ? When I was doing prep research for this trip, a lot of bloggers mentioned spending 8 hours in the park. I personally didn't intend on spending that much time there, but low and behold we did. We got there at 8 am when the park opened and left around 4:30pm. There is a lot to see, and between trying to maneuver around massive crowds, and a torrential rain storm that kept us in a restaurant for a 1.5 hours, those 8 hours flew! The Iguaçu Falls borders the state of Paraná in Brazil. We stood in the town of Foz do Iguaçu, which is 12 miles away from the falls. The park is accessible by public bus and taxi. We were short on time so we took an taxi to and from the park. Immediately after paying our entrance fee, we hopped on the free double-decker panoramic bus that went to various points in the park. We took it to the main mirador walkway of the falls. There are a number of hiking spots in the park, but we decided to skip the hike and go directly to the falls since we only had 2 hours. We followed the walkway, stopping at every viewpoint to take in the beauty of the falls. After walking for about an hour, we reached the final point of the walkway and the main attraction of the falls-- the extension to the lower base of the Garganta do Diabo. After getting drenched at the base of the falls, we took an elevator up to get an aerial view of the falls. Although the Brazilian side is much smaller, I felt that it offered better views because it shows the entire landscape of the falls. We saw so many animals in both parks, including monkeys, butterflies, and iguanas. The one animal you really have to be careful around are the coaties. These little animals are part of the raccoon family, and although they appear sweet, they can be vicious. The Brazilian side had a lot of graphic posters of humans attacked by coati to discourage people from touching them. Be extremely careful with your food around them. I witnessed a few coaties doing a grab and run from an elderly couple. Basically, if you don't do what the people are doing in the left picture below, you should be fine. Dry bag- If you go on the boat ride you will be provided with a dry bag to store your belongings; however, I found my bag was useful to have while walking through the park. Waterproof pants- It was really hot when we visited so I wore athletic shorts during the walk and put on my waterproof pants when it was time for the boat ride. water shoes- By far one of my most useful travel related purchases. There's nothing worst then soggy shoes. So, which side should you visit? As you can see it is a extremely hard choice to make. 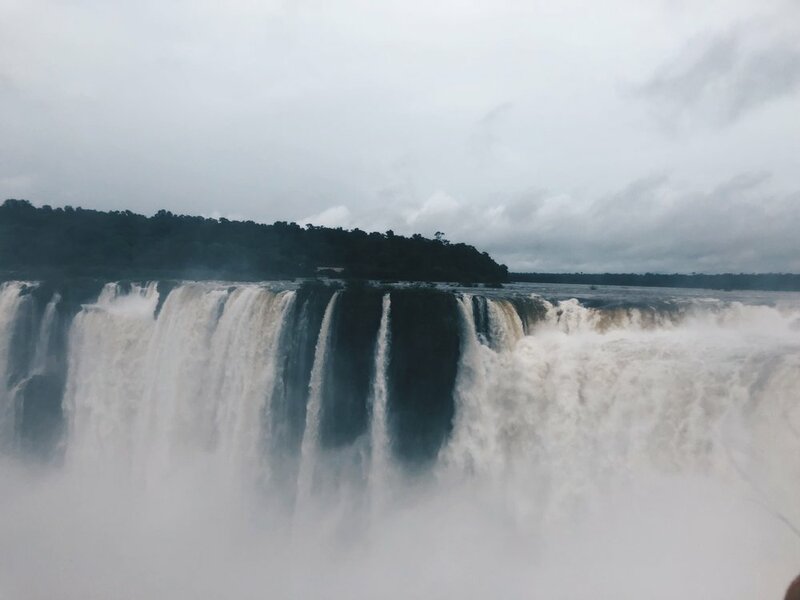 The Brazilian side offers amazing panoramic views of the falls and the Argentinian side offers opportunity to get up close to the falls. Both have lovely walks through forested scenery, but of course you'll get more of that on the Argentinian side since it covers more land. Ultimately, I say go to both if you can! However, there may be practical reasons for choosing one side. For, U.S. citizens the price of the Brazilian visa is steep ($160). 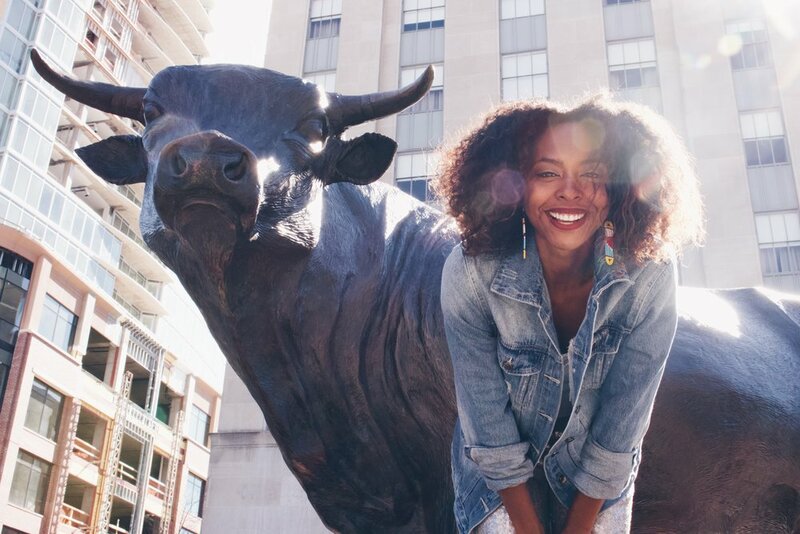 U.S. tourists don't need a visa to enter Argentina. Overall, a visit to the Iguazu Falls is a majestic experience and you really can't go wrong visiting either side! Have you been to the Iguazu Falls? How was your experience?